Both teams were differentiated by a single point in the points table, which made it difficult to pick an out and out favourite for this encounter. Both teams were led by captains, who made sure that their overall tactics were well supported by their own bat. Captain of Kolkata Knight Riders, Gautam Gambhir, won the toss and elected to field. It seemed that the toss was a draw when the opposition captain in David Warner expressed desires of batting first. Both teams had made four changes to their squad. Kolkata included Ishank Jaggi for the first time in the season as a replacement for the injured Manish Pandey. Suryakumar Yadav, Piyush Chawla and Nathan Coulter-Nile were the others who were named in the playing eleven. Colin de Grandhomme, Kuldeep Yadav and Ankit Rajpoot were rested for this match. On similar grounds, SRH had called up Chris Jordan in place of injured Mohammad Nabi. Moises Henriques, Deepak Hooda and Mohammed Siraj had to make way for Kane Williamson, Yuvraj Singh and Bipul Sharma. Nathan Coulter-Nile was declared the Man of the Match. Sharing the new ball for KKR, Umesh Yadav and Trent Boult did not allow Warner and Shikhar Dhawan to break free in the first four overs. In what was his first attempt to do the same, Dhawan (11) had to walk back to the pavilion when his leading edge was taken by Robin Uthappa behind the stumps off Umesh Yadav. Both Warner (37) and Williamson (24) took their own personal time to settle in. Just when it was time for the Trans-Tasman duo to take off, both of them were dismissed within three balls by Coulter-Nile and Chawla respectively. With more than seven overs to go, Yuvraj Singh was more than just a hope for the SunRisers. But the southpaw, too, did not affect the scorecard much as he was dismissed on 9 by Umesh Yadav in the 16th over. Vijay Shankar (22) and Naman Ojha (16) tried their best to make sure that their team scored 128-7 in 20 overs. At the end of the first innings, SunRisers were clearly short of 25 runs. At one point of time, WWE had overtaken cricket. Just when KKR was about to pin down SRH, rain came from behind (above) and played the spoilsport. A two-way contest had turned out to be a triple threat match. After the covers were put in and removed a couple of times, play was finally scheduled to begin at 12:55 AM. The news was a sigh of relief for KKR for no play would have enabled SRH to play the Qualifier 2 (because they were above KKR in the points table during the league stage) against Mumbai Indians tomorrow. 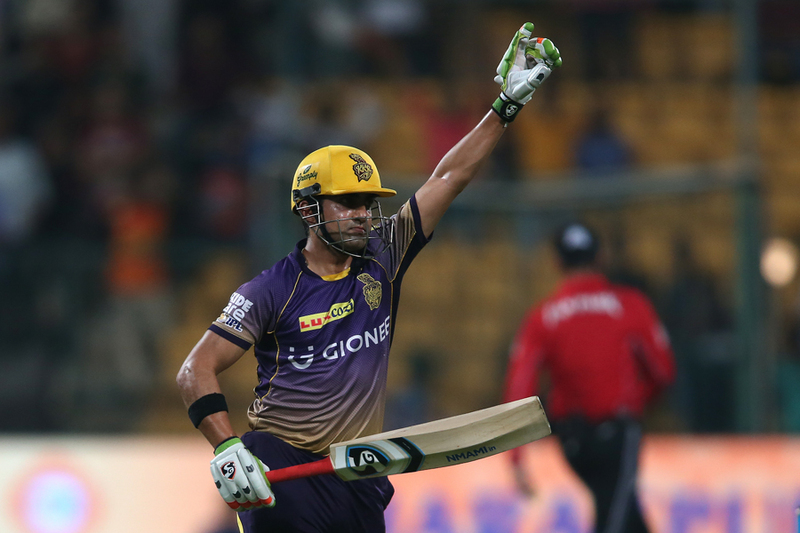 Knight Riders were set a target of 48 runs to win from six overs. With two overs of powerplay and 10 wickets in hand, the equation was very simple for them. But was it? Gambhir led from the front by scoring 32* (19). A new opening combination of Robin Uthappa and Chris Lynn was sent in to face the new ball. Lynn struck a six off the first ball that he faced but was caught behind on the second. Yusuf Pathan was sent in at No. 3 and was run-out on the first ball itself. A couple of changes proved that there was a sense of urgency. A sense of panic. A sense of pressure of the big game which increased when Uthappa (1) pulled a Chris Jordan delivery straight to Dhawan at deep square leg. If there was someone who could have provided calmness to this panic, it was Gambhir's controlled aggression. He wisely targeted Siddhath Kaul and collected 14 very crucial runs from his over. Scoring runs in bulk was not the call of the hour. One good over and KKR was through. Gambhir (31*) and Ishank Jaggi (5*) finally kicked out the defending champions with four balls to spare. In what was a potential quarter-final for KKR, they now have to get past Mumbai at the same venue in a virtual semi-final to reach the final of IPL 10.